Just so you know, I’m writing this post for free Christmas cards. Tiny Prints is giving me 50 free cards to write about their cards. You guys, I love Christmas photo cards. I’m embarrassed to admit that last year is the only year I’ve been together enough to get photo cards made up and sent out. But this year I’m on top of it again! I also love Tiny Prints. I used them for Kalena’s birth announcements and I was VERY pleased with the results, so I used them again for Will’s. (Did I send you a birth announcement? 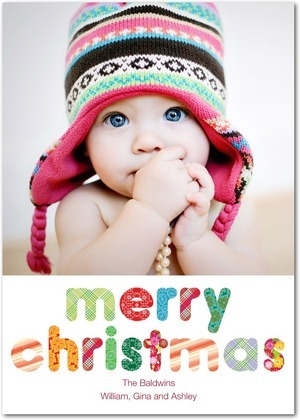 My adorable children are only part of the reason those cards are so cute.) Also, talked Kirsta into using them for Eli’s birth announcements and those were adorable as well. Anyway, enough about birth announcements. 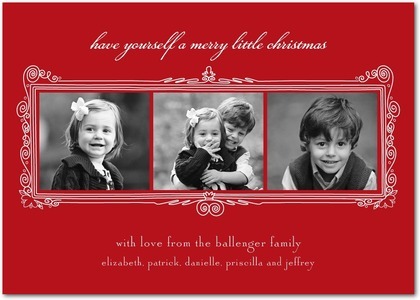 Tiny Prints also has a huge selection of holiday cards! So huge, in fact, that I had some issues picking favorites. They have handy little filters on the side of the page but even after I’d input my preferences (which are admittedly few- I don’t want to limit myself!) I came up with approximately one million cards that I loved. (No seriously, I had like 30 “favorite cards.”) BUT. I love you guys and I won’t bore you with my 30 favorite cards (unless you want to come over and look at them with me) so I narrowed it down to 6. However, we don’t actually have our picture(s) yet so my favorites may change. ANYWAY. Patterned Christmas I think this would be great if we just do a playful picture with both kiddos. 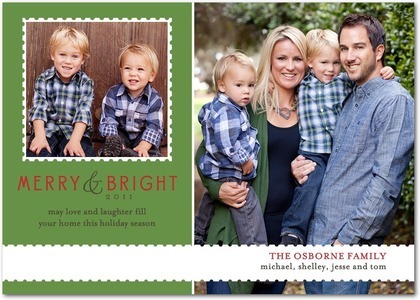 Merry Stamp In my head I’d like one family pic and one of the kids, and this card would be perfect for that. We’ll see about the reality of the pictures. Scrolling Frame I love this one, but it might be too fancy. Also, not sure how it would look with color pictures- Brian doesn’t like to do black and white for cards. Kalena’s dress is red and white so I’m hoping it would look GREAT with this one. Holiday in Nature If we end up with only one good family picture, this card is definitely top of my list. Scalloped Trim Maybe I like this card because I’m really hoping we can manage the “happy family everyone smiling and looking at the camera” picture AND the happy smiling baby picture. Okay, also the colors. The whole card looks very happy to me. Triple Gift The other “in my head” version of our card includes one family pic, one of the kids together, and one of my belly. Because I want it to be clear on the card that I’m pregnant and not just fat. And I see those pictures on this card. Now I just have to talk one of my talented friends into taking pictures for us… Oh, and a question for you guys: do you prefer photo cards with pictures of the whole family or just the kids? Last year I did just the kids (because let’s face it, they’re cuter than Brian and I) but I’m thinking I’ll change it up this year. Want to pick your own favorite cards? You can check out the whole holiday line here. Want to participate in this promotion? Fill out this form. My only suggestion is to not do one family picture and then two pictures of each of your kid's (4 total) faces floating around the family picture. Because it will look like you have six kids and you picked your favorite two for the family picture. This is what Jason's boss did last year. And it was kind of weird. Definitely the whole family. It's a bonus if there is another of just the kids. I think the first one is my favorite. But all of them are great. I like pictures of the whole family. I also used tinyprints for Amelia's birth announcement and I'm about to use it again for Addilyn's!